Gameception / Abduction – The team game that creates itself!Gameception / Abduction– The team game that creates itself!Gameception / Abduction– The team game that creates itself!Gameception / Abduction– The team game that creates itself!Gameception / Abduction– The team game that creates itself! 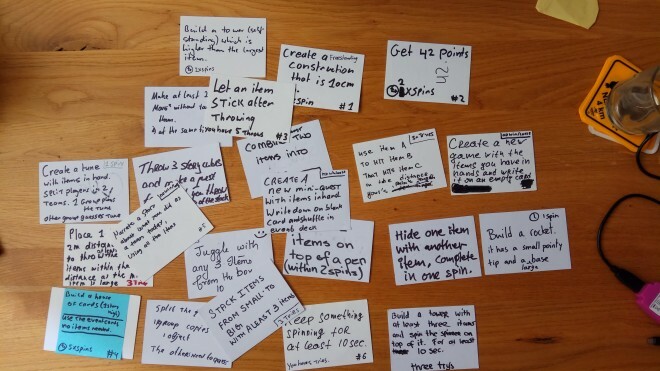 TL;DR Get yourself some office supplies, a pouch or box, write the game rules on a flipchart, write a couple of quests on an empty card and have fun! Good for: Explain usage of user stories and acceptance criteria/Creativitiy/Energizer/FUN! Gameception is a cooperative game of creativity and fun. We found it’s a fun way of getting people to think out of the box. Furthermore it can explain what happends when you throw 3 sentence user stories to a team and not refine them. You can also use it several times in a team this way it will really be a game the team created itself. Abduction is the alien abduction themed version of Gameception. The rules stay the same. With Abduction however the narration is that people are abducted by aliens that want to experiment on you as a group. The experiments are the quests which shows how creative people are. Each player randomly picks an item from the box till you have in total 6 items in total. Repeat these steps until you either meet the win or lose goal. Win: After you won a quest in the round were could pick 3 items in total. Lost: After you lost a quest where you started a round with picking 7 items in total. Split the player group in 2. 1 group creates a tune with the item. Group 2 has to guess what tune it is. Have you created new cool quests? post them in the review and I shall update them here. – Have a facilitator ask the team if a quest is won or lost, but let the team be creative and decide themselves. – Quests are better if they are potentially playable with other items. The items are just to get the creativity flowing. As facilitator try to remind the team of this. Play testing is allowed of course. As facilitator you might even encourage that. How else do you know it’s possible to succeed the quest? Also try to think about time/tries (constraints) and win/lose conditions. Gameception was created at Play4Agile in Feb 2016. 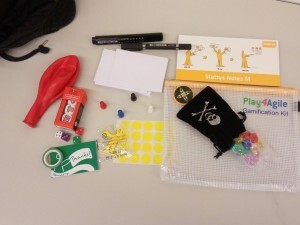 Daniel Hommel mentioned in the open space he had a gamification kit of the previous play4agile still closed in the drawer. Since he wanted to prevent this for the current kit he encouraged us to come up with a game based on the kit. Tim Yevgrashyn and I came with the initial idea. After an additional open space we game played the game and tweaked the game the following day with several participants of Play4Agile 2016. Gameception has now been played on half a dozen conferences, teams I’ve worked with and a couple of my friends. It proofs to be a game quite a lot of people like and want t reproduce. Thank you all to encourage me to describe the game and share it with the world. I am a little bit confused here. Do we have to set the end goal before starting the game? Or, each quest card is a goal? 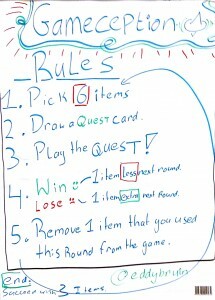 The goal of the game is to finish a quest with 3 items. I was one of the early beta-testers of Gameception during Play4Agile conference where the game was created and loved it. I was sceptical upfront whether a game can create itself but it really worked and to build new challenges was big fun. The idea is sheer genius! This sounds like a great idea, planning to use it in my software engineering course. Does anyone have example quests that worked well before? Cool that you would like to pick this up. 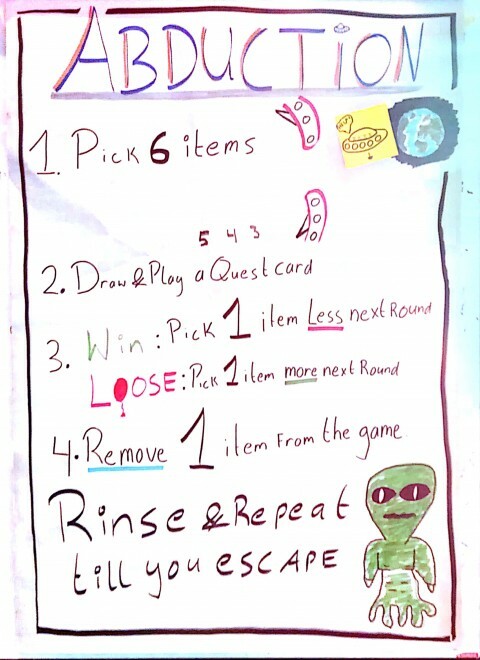 Gameception did have an upgrade in terms of flavouring which enables people to play it with a theme called Abduction. I’ll update the post accordingly. o	Create a new mini-quest with items in hand. Write down the quest on a blank card and shuffle it in the quest deck. This card has to be in there, but you would not like it to be the first. I often cheat by putting it in 3rd or 4th. •	Get 42 Points (Time: 1 spin) I found this quest to be very cool, because it can spin some great creativity. For a first quest though it is not very suitable since it gives groups to much freedom without experiencing the concept of the game first. 2. I assume people can create new quest cards at any stage during the game. Any tips on how to get people creating their own quests if they’re not forthcoming? 3. Do the dynamics of the game tend to change at all if there’s different teams competing against each other? 1. all at once. Large groups can be splitted though and than multiple quests at the same time can be played. 2. I Usually cheat by making the 3rd quest card the quest where the team need to create a new one. 3. The dynamics change since people want to win from the other team if played at once. It will also change if they now the quests cards will be given to the other team at some point. They’ ll make the quests harder to win.